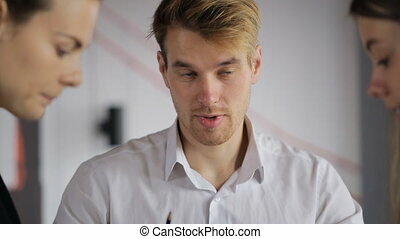 Young beautiful woman head of office listens to employee on work carried out near a window. Young woman in a cyan shirt with an open diary in hand and tells user about success of work of division during month. Listens to her standing next to a woman in a black business suit with a tablet with a touchscreen in hand and nodding and making notes in an electronic document. They are standing next to an open window on street, they installed new double-glazed. Close-up view of business woman working with documents. Sitting in office young and beautiful female is reading agreement or business treatment prescribing work order, schedule or company development perspectives. Concentrated on graphics showing increase and decrease of rated she is planning her job. She has long straight blonde hair done in pony-tail wearing classic formal blouse of white color with no sleeves. There are bookshelves and small window on background. Closeup view on hands of office workers and documents indoors. 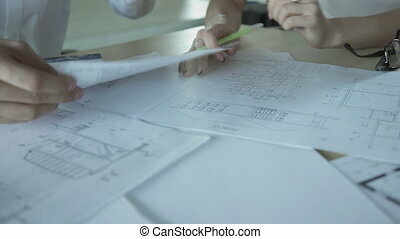 United team of architects working on common building project with couple of floors. Actively discussing details of work with blueprints, group of professionals listening to each other and accepting offers for improving future draft. Man in white shirt taking document with project declaration, show partners to consider new construction plan. 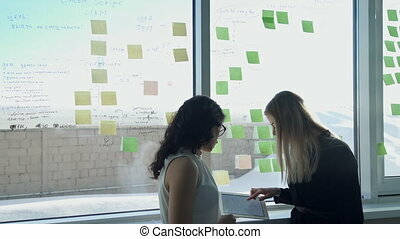 Two women actively participate in process, promoting ideas. Co-working people are discussing documents sitting in office. Sitting round at desk male and females are talking about graphics, diagrams, blueprints and construction plan connected with future development and company perspectives making corrections of mistakes with a help of stationery such as pencils and pens. There are big portrait windows with beautiful road view with cars driving on background. 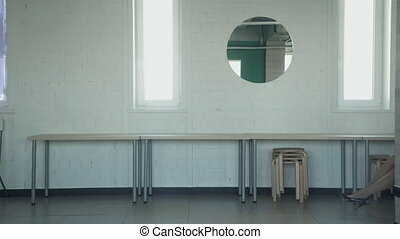 There are chairs and tables used for comfortable work. 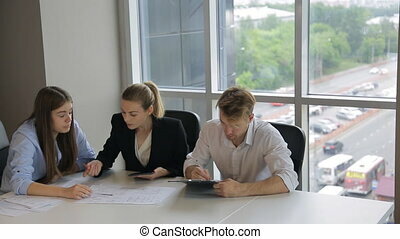 Team of young professionals works closely on mutual project in office. On business meeting brunette and blonde women discuss ideas with man and listen suggestions of one another. 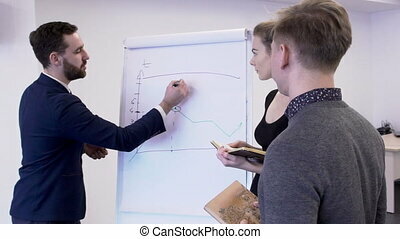 Male tells plan to realize objectives in good way. 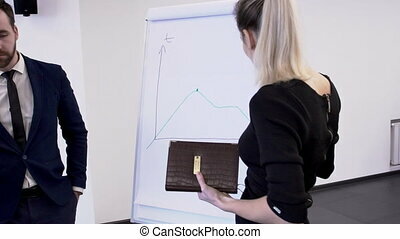 Females agree with man and ready to start working with enthusiasm. Documents and schematics are on desk. Partners sitting across from each other in comfortable chairs. On background big office with several workplaces and worker. 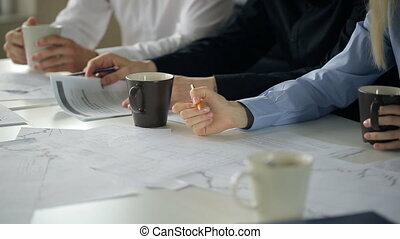 A group of people sitting at confer table in office, woman makes notes with pencil on paper. Two men in shirts and one woman in a light blue blouse, sitting at a white table on which lay a variety of charts, plans and paper documents. They are talking with cups of tea or coffee in hand. Their group discusses issues associated with their work or prepared to report progress in their job for bosses. Woman holds in her right hand a yellow pencil which makes notes in document.